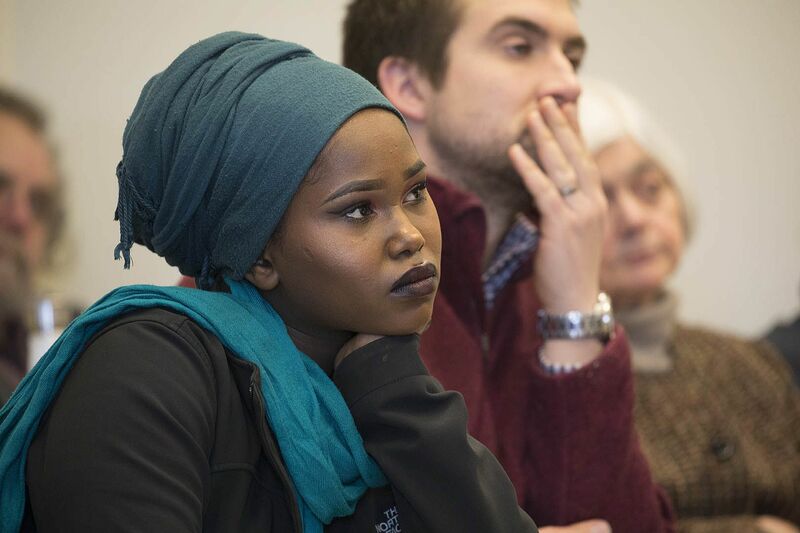 A senior at Edward Little High School, 18-year-old Shukri Abdirahman attended a workshop on working with new Mainers, hosted by Maine Immigrant and Refugee Services. 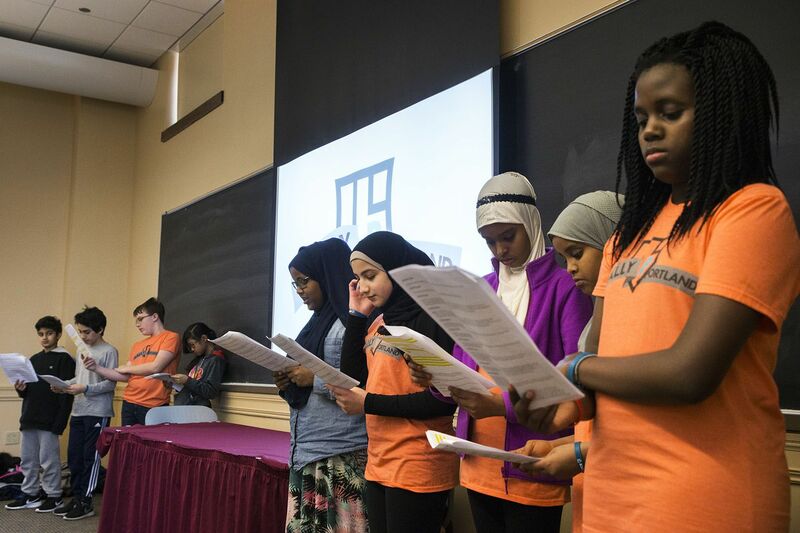 Since attending a leadership-training program in New Jersey, Abdirahman has gone to every workshop on justice and equality she can find. It’s good to see different points of view, and it’s good to get educated, to hear speakers who have been in the field of social justice. I wanted to ask them what I can do as a teenager — because change doesn’t come when you’re old; it comes when you’re ready. I want to ask them how I can go on and what I can do. I thought that if anyone could know the answer, a professor would. But maybe he didn’t, and that’s OK. I’ve been retired for 30 years and I live nearby, so I come to all the events. I learn something every time I come here. I’ve been to Bates for MLK Day for 30 years. Today is not entertainment, per se, but rather it is interesting. Today’s [keynote] speaker was the best in my 30 years of coming to MLK Day. She was knowledgeable, she was a good speaker, and she was factual. I believed everything she told us. I told that to President Spencer, and she said to tell the speaker. So I did. And she thanked me. Ellijah McLean ’20 of Providence, R.I., was part of a panel discussion on the history of protest in athletics. A high school athlete, McLean said that sports can offer a “safe haven” from many of life’s difficulties. However, in his high school experience, sports did not provide a safe space for dealing with certain racial injustices, including taunts from opposing teams. When I’m in Commons tomorrow and the next day, we’re still going to be talking about today’s events. That’s cool. In class on Tuesday, Wednesday, and Thursday, and in the coming weeks, we’ll be talking about today. Bates does a fantastic job of elevating MLK Day to another level. There’s a universal understanding that this day is tremendously important within our community. Other institutions don’t do this. It makes me feel extraordinarily welcome and makes me feel that Bates is making a genuine and valid effort to educate individual students and the entire community about MLK Day. 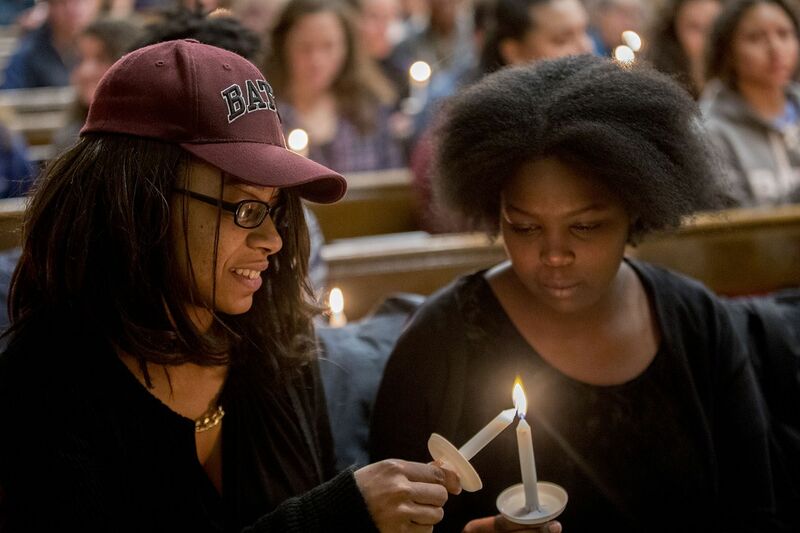 During the interfaith service on the eve of Martin Luther King Jr. Day, the Gospelaires, Bates’ gospel ensemble, sang Tasha Cobbs’ “Break Every Chain.” Megan Guynes ’11, who founded the group at Bates and has been a member ever since, sang a solo. It’s a beautiful feeling to have so many different kinds of people come together, because the Gospelaires have always been a community — it’s a connection of students, faculty, and community members. It’s a way to express the unity that King really fought for, across lines of difference, across ages, across socioeconomic status, pretty much anything you can think of. It’s coming together and realizing that at the end of the day, we’re all fighting for the same thing. In 1990, Lewiston elected John Jenkins ’74 as its first African American mayor. Since then, he has served in the Maine Senate and as mayor of Auburn and is now an educator at Lincoln Academy in Newcastle, Maine. As a high school student in Newark, N.J., Jenkins introduced the Rev. Martin Luther King Jr. when King spoke at South Side High School on March 27, 1968. As Dr. King said, “The arc of the moral universe is long, but it bends toward justice.” That arc also wraps its ends together. A week before Dr. King’s assassination, I introduced him when he spoke at my high school. Who knew that a couple of years later, I would be at Bates College befriending his mentor, Benjamin E. Mays? That’s a full circle. I was no great shakes. I didn’t know much. I thought relationships were about what you can do for folks. I thought people befriended you because they could get something from you. I had nothing to give Dr. Mays. Yet he would take time for me during his very busy schedule when he was here. He sat with me for hours to talk about life. I’ve tried to live by that — taking time for any student anytime there’s a question. Mays focused on your personhood, and that’s what we heard today. Dr. Mays exemplified that. 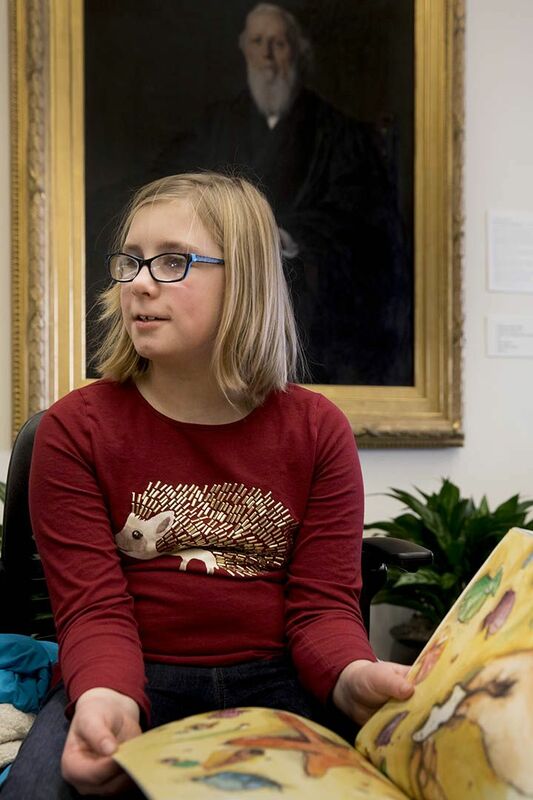 A third-grader at the Carrie Ricker School in Litchfield, 9-year-old Fiona McDonough attended a workshop at Ladd Library where families, students, and faculty members read books from Bates’ Diverse Book Collection. After reading The Sandwich Swap to the group, Brenna Callahan ’15 invited the children to read a story from the collection and then create an art project reflecting how friendship was portrayed in the book. McDonough read Immi’s Gift with her father, David McDonough, who directs the Bates Career Development Center. The Sandwich Swap is about two friends who are together, and Immi’s Gift is about two people who are far away and connected without knowing it. My favorite part of the story was when Immi kept finding beautiful gifts in her cold home, making her world brighter and more colorful. The stories are almost the same but are about different ways that people can learn about each other. Katrina Buchta ’16 is director of education at Portland Community Squash, a nonprofit that offers an affordable and nonexclusive entry to the sport of squash as well as college-prep help in classroom settings. 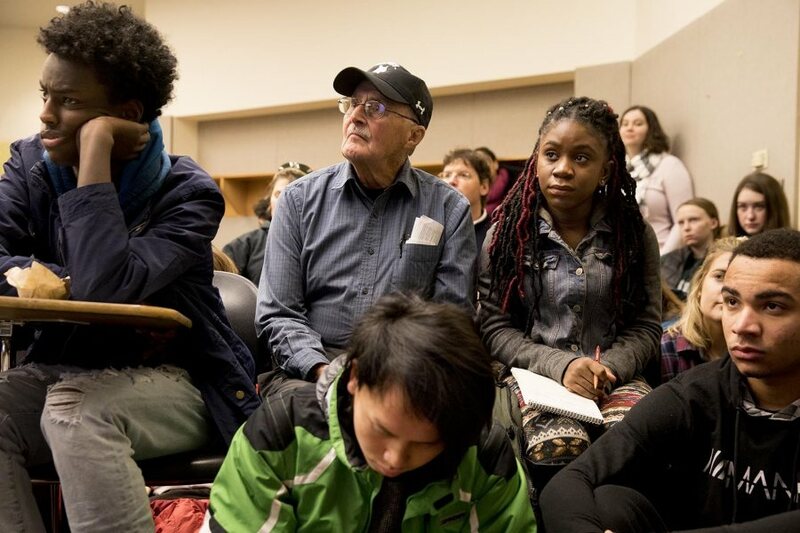 Buchta was joined by middle-school students from the group’s Rally Portland initiative, which supports aspiring first-generation college students. I really want to stay engaged with Bates, especially through an avenue like this. 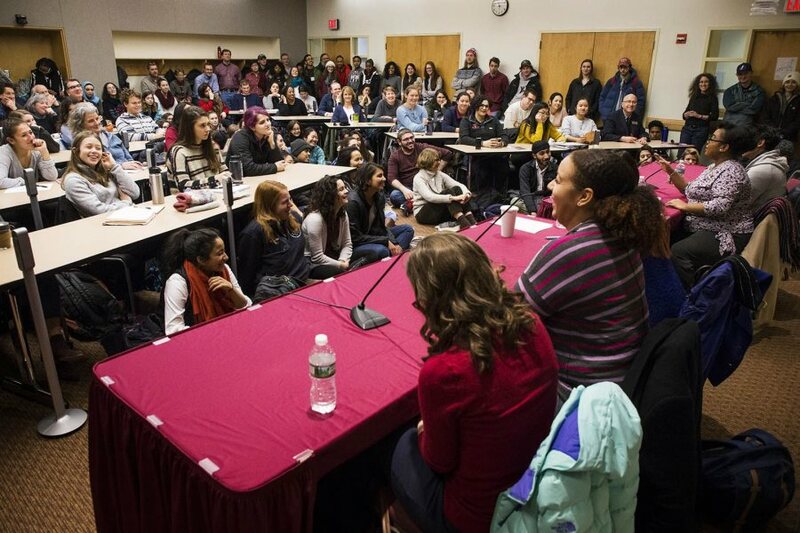 When I was a student, MLK Day was one of my favorite days at Bates, especially as a junior and senior, when I was getting more involved with my community-engaged fieldwork experiences and research I was doing for sociology, my major, and education. For this group of kids, just having the opportunity to come here and have a platform to speak about Portland Community Squash and their experiences is really special. When I was planning trips for this group, getting them to come to Bates on MLK Day was one of my priorities because the day always meant a lot to me. I hope it means a lot to them, too. On Tuesday afternoon, the sixth graders at Martel Elementary School in Lewiston were very quiet: The Rev. James F. Reese, father of Associate Dean of Students for International Programs James Reese, was about to speak. The elder Reese, age 94, is an annual visitor — via speakerphone — to the school on MLK Day (last year, he visited the students in person). 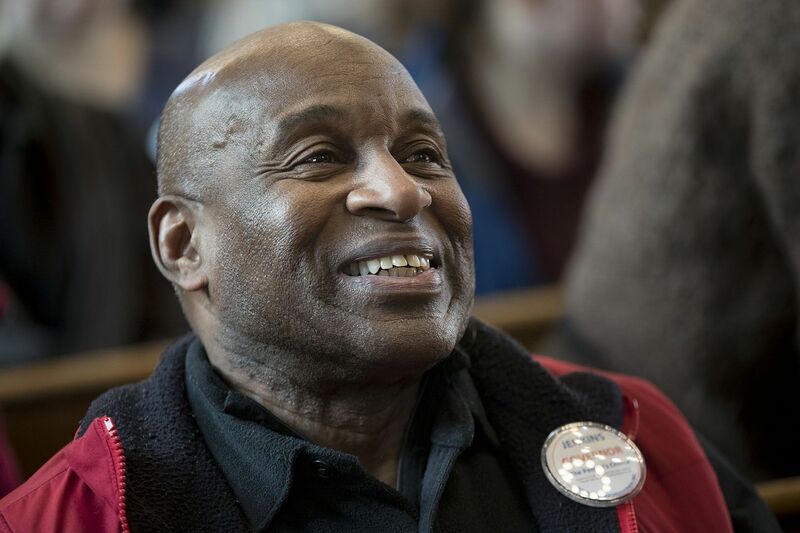 As in past years, the students heard Reese talk about his time as a civil rights activist in the 1960s, about fighting Southern segregation, and about hearing King’s “I Have A Dream” speech in 1963. 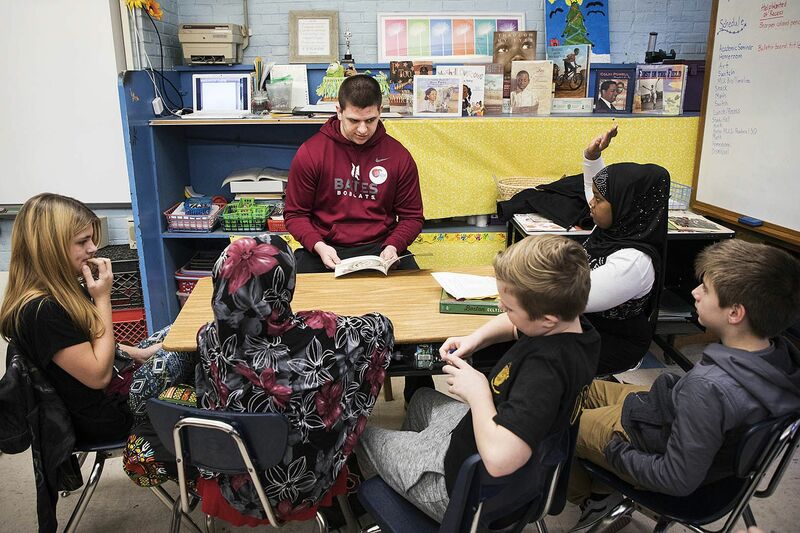 Earlier, Bates students, staff, and community members, including Patrick Whelan ’21 of Melrose, Mass., read books to Martel students, donating the books to their classrooms. Whelan had learned about the MLK Day Read-in from his football coach, Mark Harriman. I read a picture book about Ruby Bridges, the only African American girl to go to a white school in New Orleans that had been desegregated. The students liked it. They had heard similar stories and were interested in how it related to what they had learned in class. It was good for me because I got to participate in what the school offered and help educate other young people. 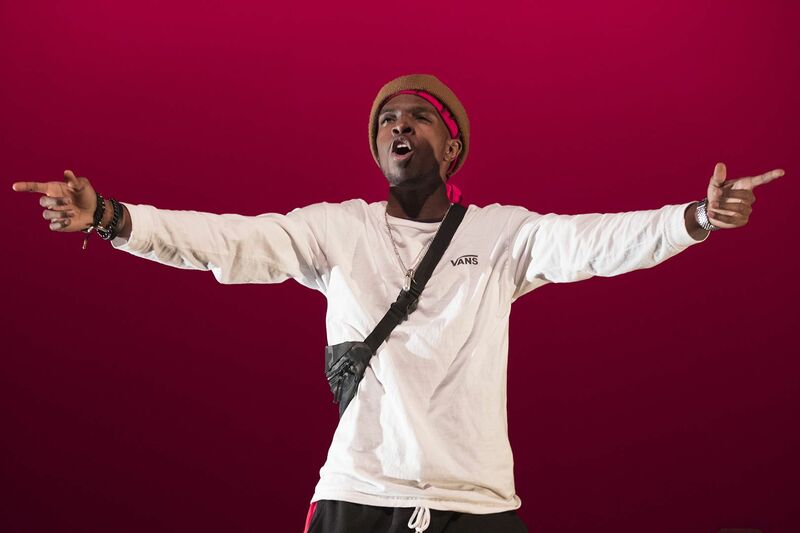 Each year, Bates students produce Sankofa, which celebrates the African diaspora through music, dance, and theater. This year’s performance, Try, Try Again, was written and directed by Michael Hogue ’20 of Chicago. Hogue drew from his own experiences to create and play the character V, a high school student and spoken-word artist whose love for the people around him is misunderstood and rejected, but ultimately triumphant. I wanted to focus on education and love, specifically in the black community and even more specifically in the black community that I experienced growing up. Being black and growing up in America often goes un-narrated. If they want their story to be heard, it’s up to the people to tell it. I structured it so that my character, V, gets taken away at the end. Hopefully, everyone sees the love he had for his classmates and his people, even though they didn’t accept him. It’s recognizing the unconditional love that black people must have for each other if we want to make it. 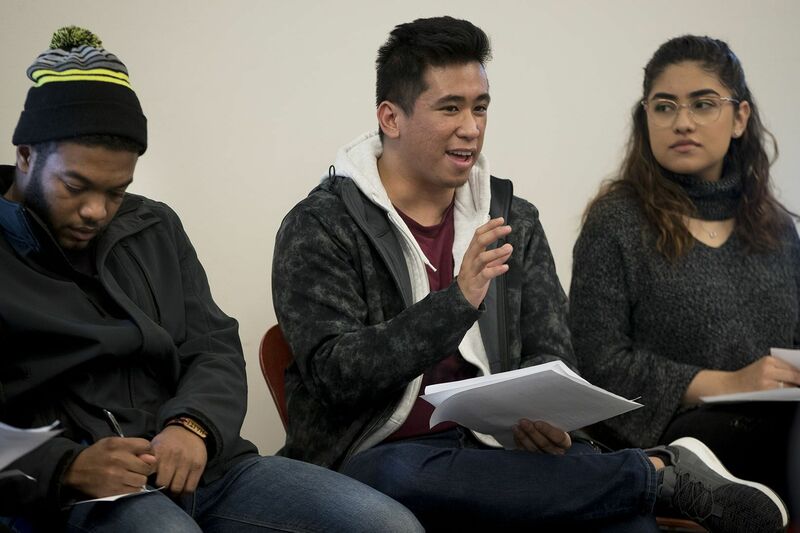 A neuroscience major, John Collantes ’18 of Park Ridge, Ill., was one of eight students of color majoring in STEM fields who shared experiences, motivations, and advice about succeeding in the sciences at Bates. My interest in the sciences definitely overpowers any obstructions that I’ve come to. In terms of keeping myself motivated when the going gets tough, one thing I definitely don’t do is compare myself with other people. Coming here, where a lot of students are from high schools that are better than the one I went to, makes it easy to compare myself with other people and to think that I’m not going to be as good as them, that I don’t have their skills or experience. It’s very easy to go down that hole. But I’ve realized that I am my own person, I have my own skills, and there’s a reason why I got into a school like Bates. Coinciding with MLK Day observances was a New Scholars Symposium on Fostering Diversity in Microbiology. One of the visiting scientists taking part was Lori Banks, a postdoctoral researcher in the Department of Molecular Virology and Microbiology at Baylor. She, with her fellow visitors, offered views on ways that academe supports — or fails — students from groups underrepresented in STEM fields. As an aspiring scientist, you have to understand that you see things like nobody else sees them, and that’s a good thing. Own who you are. Recognize what’s in yourself — whatever set of experiences you come from will give you a different perspective than anyone else. I’ll give you an example: My daughter is about to be 6, and she was born when I was working in an anthrax lab. My baby shower had lots of giant microbe toys. I’ll never forget watching my daughter play with her little E. coli doll that has the little flagella — and she’s braiding the flagella. That’s her experience, you know? She’s a little black girl and she has braids, so she decided that the E. coli was female, first of all, and had little braids and barrettes like she had. She’s coming from that perspective into the world she’s potentially going to go into as a scientist. Other people have different perspectives, but that doesn’t negate hers. 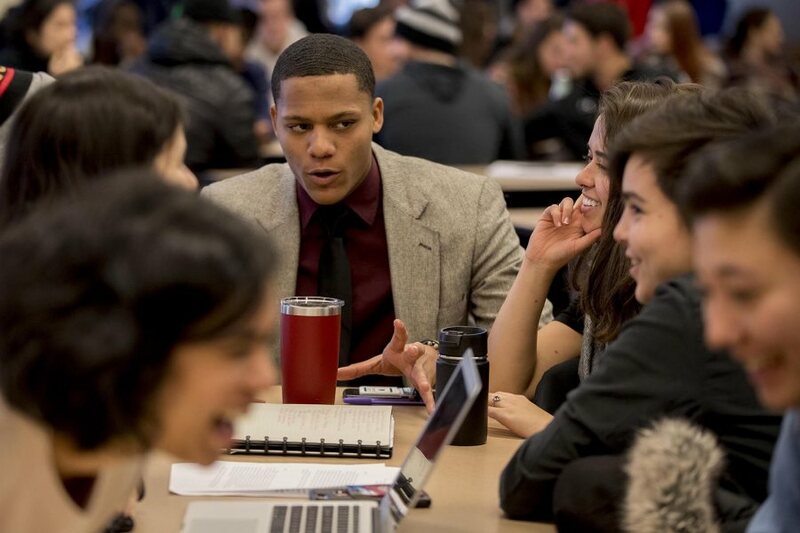 The popular Benjamin E. Mays, Class of 1920, Debate brings together debaters from Bates and from Morehouse College, where Mays is revered for his service as president from 1940 to 1967. This year’s topic was “This house supports racially homogenous schools,” and the debaters delved into the value of diversity in higher education and its impacts, especially on students of color. 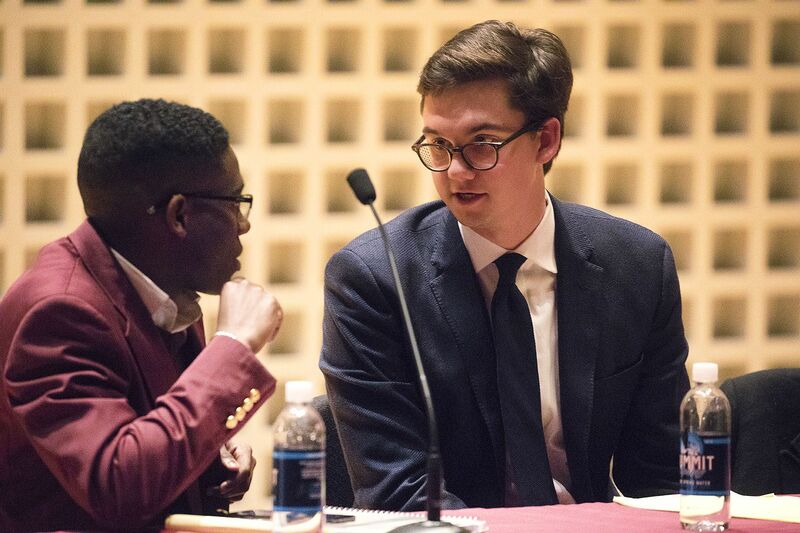 That’s the value of debate, said Matt Davis ’18, who teamed with Caleb Holly of Morehouse to argue the government side, while Abby Westberry ’18 and William Coggins of Morehouse comprised the opposition. It was nice to see that our audience took the debate seriously. People took in the arguments and thought about them, and conversations occurred once they left the room. That’s how change is effected, by getting people to change their minds and rationally examine arguments. Martin Luther King Jr. contributed immensely to discourse in this country, getting people to change their minds both through action and persuasive speaking. He made things more just for a whole lot of people.